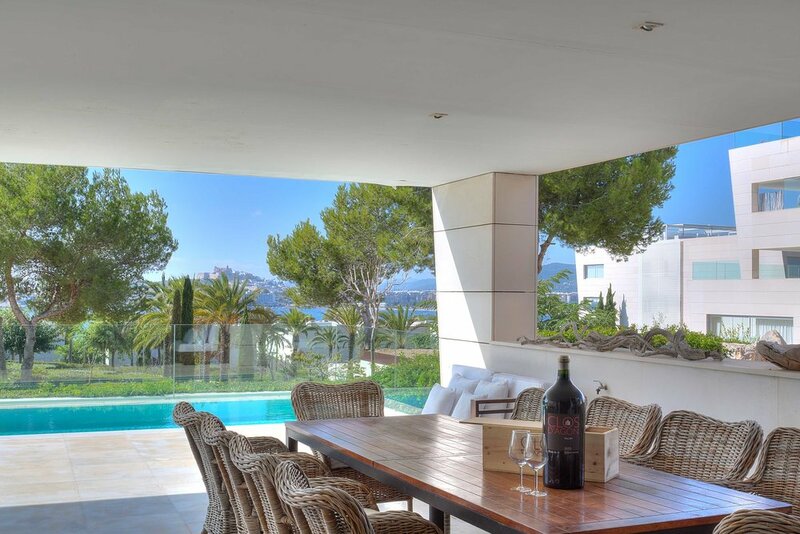 This is the Es Pouet Dalt Vista apartment sale page of Apartments in Ibiza. Your perfect place for Ibiza apartment sales and rentals. We have been selling and renting apartments and villas on the beautiful Balearic island of Ibiza since we were established in 2003. This delightful apartment has views across Talamanca bay to the Dalt Vila beyond. Although listed as three bedrooms there is a large utility space that has a drop down bed and an en-suite shower room that could be converted to a fourth bedroom. Each apartment has a sizeable storage space at car park level where the utilities (washing machine etc) could easily be moved. In all there are five bathrooms. Three en-suite to the bedrooms, the previously mentioned shower room in the utility space and a fifth bathroom off the living area for guests. The open plan living area is extremely spacious and has a fully fitted kitchen. There’s wall to wall glass with sliding door access to a large covered patio and open air private pool. The patio has space for comfortable seating and a dining table for eight. As well as en-suite bathrooms the bedrooms have ample storage with the master bedroom itself having a walk in wardrobe. The Es Pouet apartments are in a gated community that has 24 hour security (with video surveillance) and concierge. Each apartment has use of the communal gardens and pool and there’s easy access to Talamanca bay and beach. The Es Pouet apartments are situated just between Talamanca and Cap Martinet. They overlook Talamanca bay and there’s access to the bay through a private gate from the communal grounds. This means it’s a relatively short walk around to the beach and on to Marina Botafoch. The beach is around 500m away and the marina just over a kilometre. Ibiza town itself would be about 3km and the airport 12km.